The genius of The Simpsons is how they cleverly send-up popular culture and modern society in a way that makes viewers laugh, even if the things they’re laughing at are serious matters: pollution, nuclear waste, sexism, ageism, alcoholism, physical abuse, poor education. Despite the show’s regular cameo appearances by famous actors and popular guest stars, there haven’t been that many crossover episodes of The Simpsons. Here is every single The Simpsons crossover episode for your ranking pleasure - television crossovers only. One of the most popular items on this list, “The Simpsons Guy,” was actually an episode on fellow Fox animated series Family Guy. Of course, there are similarities between Homer Simpson and Peter Griffin, who are both eerily similar to Fred Flintstone, but seeing an episode finally admit that fact made for excellent television. This list features multiple episodes of The Simpsons with other TV characters and fun cameos. David Duchovny and Gillian Anderson appear as their characters from The X-Files, Agent Mulder and Agent Scully, after Homer believes he's spotted an alien in Springfield. Kiefer Sutherland and Mary Lynn Raiskub also voice their TV characters Jack Bauer and Chloe O’Brian in a classic crossover parody of 24. Make your voice heard. Vote up the best crossover episodes of The Simpsons below! It was just a matter of time before these two Fox animated shows crossed-over. Bart unknowingly threatens the future when he tosses a rabbit's foot and a snot-nosed sandwich into a time capsule. Bender (the robot from Futurama) travels back in time to kill Homer in an attempt to stop the onslaught of mutant rabbits that threaten their society. But instead, the pair develop quite a bromance. The rest of the Futurama crew travels back in time to kill Homer, however, it's determined that the Simpson family must travel to the future to fix the mutation. Is this a great episode? After having way too much to drink, Homer spots a glowing alien in the woods. No one believes him, except Bart. Agents Mulder and Scully from Fox's The X-Files show up to investigate. However, even the alien-obsessed Mulder doesn't buy Homer's story. It's eventually determined that the alien is actually a glowing-with-nuclear-radiation Mr. Burns, who is attempting yet another medical way to cheat death. Leonard Nimoy's narration adds a nice wink-wink comedic element to this classic crossover episode. The King of the Hill cast makes a very brief appearance in this episode. Homer takes over the coaching gig of Bart's pee-wee football team and assigns Bart as the new quarterback, even though Bart is not very good and Nelson was tearing it up under center. 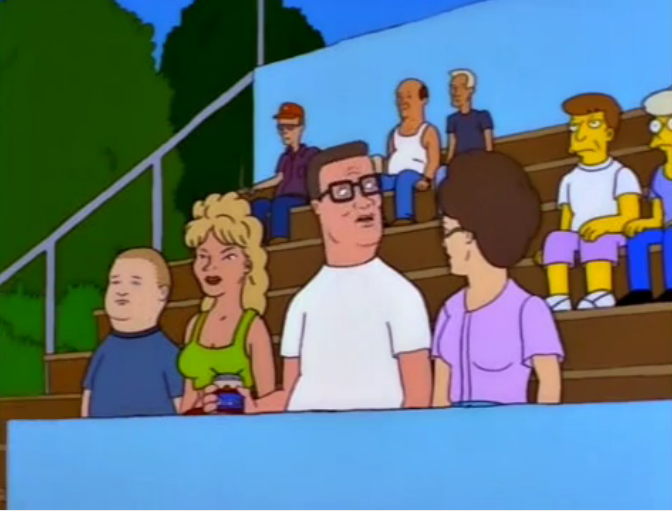 During the Springfield versus Arlen match, the cast from King of the Hill is sitting in the bleachers. Hank asks, "We drove 2,000 miles for this?" That's it from the Hill family, but the special cameo adds a great comedic touch. Springfield is declared the crappiest city in America. In order to boost its tourism and community morale, the town decides to host a film festival with Jay Sherman (Jon Lovitz) from the animated show The Critic, as the crossover guest judge. Mr. Burns wants to buy the first place prize with a high-budget epic directed by Señor Spielbergo. Also among the entries is Barney's poetic and heartbreaking film about his battle with alcoholism. In the end, The Simpsons make an astute comment on American society, when George C. Scott's submission, "Man Getting Hit with a Football," (which is simply the Moleman taking a football to the groin), wins the top prize.